The entry level for becoming a WordPress Genesis developer is pretty low. If you have working knowledge of PHP, HTML and CSS you are good to go. The WordPress and Genesis ecosystem is such that you can start working on things instantly. Especially working with Genesis is a piece of cake. It’s fairly easy to get started with Genesis. The Genesis child themes have made it possible by offering niche specific themes… and they look professional and mean business. However, installing WordPress, configuring Genesis and setting up the child theme is just the beginning. Nonetheless, it is a good start — quickly set-up the theme, add minor customizations and keep learning new things and keep expanding your skill-set. The mantra here is “learn by doing things”. There are a plenty of developers and resources in WordPress and Genesis space that will help you in growing your skills so that you can easily sift your way through various levels of developers. I have learned a lot from trial & error and eventually learned how to grep my way through theme files to dig the unknown mysteries of the framework. The scenario has changed now and thankfully there are a lot of tutorials, beginner guides and code snippets available to make your life easy as a WordPress Genesis developer. The Genesis Framework is backed by a strong StudioPress and Genesis community in much a similar way like WordPress. Forums, Facebook group, Slack community, Twitter, Google+… you are all covered. It is a good starting point for the beginners to find help and get started. Genesis Facebook group is a closed group. You will need to apply to join as a member. There are mix of developers, designers and regular people who will be happy to help you with all kind of issues related with WordPress and Genesis. Genesis community on Google+ provides a very good platform to the developers for sharing their tutorials and for showcasing the sites built on Genesis. The community has 3398 members at the time of writing this article. The hashtag for Genesis on Twitter is #genesiswp. You will find a lot of useful articles and latest information about Genesis and StudioPress via Genesis on Twitter. Genesis is on Slack too! And here is a quick article to join and be a part of Genesis community on Slack. StudioPress offers several resources to make it easy for the developers to be a part of Genesis ecosystem. Then there are dedicated Genesis developers and contributors who provide visual reference guides, publish Genesis changelog, cover Genesis related news and interviews with developers. Here StudioPress brings together getting started tutorials. These tutorials give a fair idea about the things you can do with Genesis and provide a glimpse into the customizability of the framework. 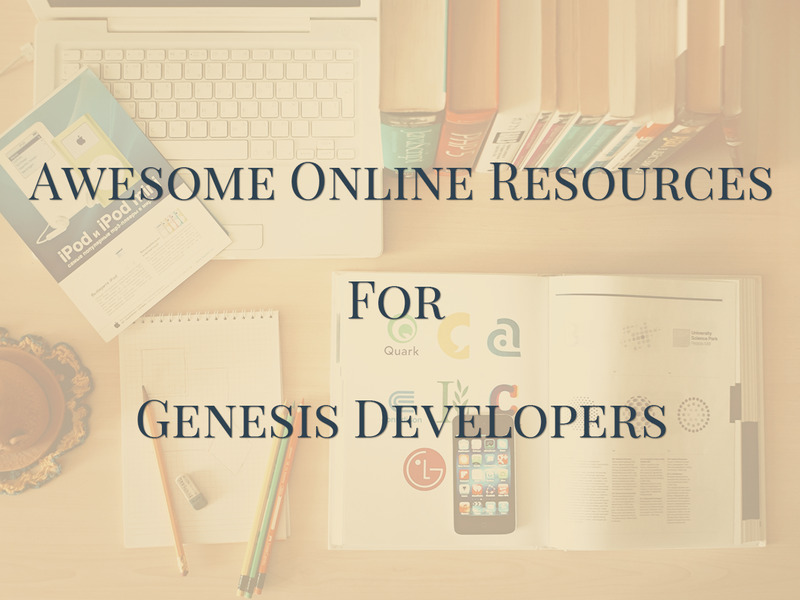 These resources are contributed by the early adopters of Genesis framework to help the fellow developers to get started with child theme customizations or for building custom Genesis child themes. This is an ebook complied by StudioPress. It gives a complete overview of Genesis as a framework. Over the 12 chapters it covers everything required to get started with Genesis. It starts with defining a framework, advances to the concept of child themes, walks you through theme settings (and SEO panel) and concludes with troubleshooting tips. It is like a bible for the Genesis developers who are just starting out. The Genesis shortcodes reference explains how to use the shortcodes defined by Genesis. It comes in handy while customizing existing child theme or when building custom solution for clients. It also comes in handy while building Genesis specific plugins. Gary Jones, one of the lead Genesis developers puts together the list of changes introduced in each new version the framework on GenesisChangelog.Com. It is a good place to get in grips with what’s new in the latest version of the theme framework. Genesis is a hook based theme. This is one of the reasons which make it a robust and flexible parent theme. The developers selectively play around with the hooks to present their customizations in the form of the Genesis child theme. And as a developer, I always keep the visual hooks reference bookmarked in my browser and use it whenever I work on Genesis project. Nathan Rice has put together this markup guide to help you get a general idea of the classes and IDs used in the making of Genesis HTML markup. The team at Web Savvy Marketing has created a CSS guide. It is a pretty simple guide to give you an overview of CSS basics wrt WordPress and Genesis. Nick Davis is doing an excellent job on Genesis WP Guide. Genesis WP guide is a weekly digest for everything related to Genesis. He covers theme launches, latest tutorials, welcomes new members in the community and also interviews budding Genesis developers. Genesis office hours by Carrie Dils is focused on interviewing Genesis developers about their successful business model. Just catch up the show every weekend and you will get to learn some real smart tips and tricks. And some development and business secrets too! Sridhar Katakam has been actively serving Genesis community via StudioPress forums, FB group and Slack. And has built a huge help resource with Genesis articles for pretty much every Genesis child theme. Recently he turned his site into a membership site. Now you need to signup for the membership to access 500+ premium tutorials and request tutorials. When I started working on Genesis, every time I searched for “how to” in Genesis I use to land on WP Sites. Brad Dalton has very well covered each and every aspect of Genesis customization in over 1700 tutorials & 3000+ code snippets. This site has also become a membership site now and you have to pay $47 for monthly access. Here’s list of sites where you can find a lot of code snippets (and a few articles). The tutorials and code snippets on these sites will not only help you in extending the functionality of Genesis child theme; but will also let your creative juices flowing. A series of video tutorials hosted on Lynda; in collaboration with Carrie Dils. A beginners course hosted on TeamTreeHouse; in collaboration with Jesse Petersen. Genesis is a theme framework for WordPress. While most of the customizations can be done with the help of Genesis hooks, filters and Genesis specific functions; you will still need to check out WordPress resources to get hands on experience as WordPress Genesis Developer. WordPress codex is no doubt the best place to find answers to all your WordPress queries. Right from the beginner stuff to power user guide you will get it all on codex. Especially when you are building Genesis themes and plugins, you will often find yourself landing on codex for things like enqueuing scripts, querying the posts, adding and retrieving custom fields, etc. You don’t need to necessarily code everything. The beauty of WordPress lies in the ability to extend the features and functionality via plugins. While most of the WordPress plugins work flawlessly with Genesis, you will find a lot of plugins in WP repo which are specifically designed for Genesis to help you add features to your Genesis site. I want to thank you for this amazing post. I was looking for this post all over. It really help to shape an idea overall. Much appreciated.